What is World Youth Day? 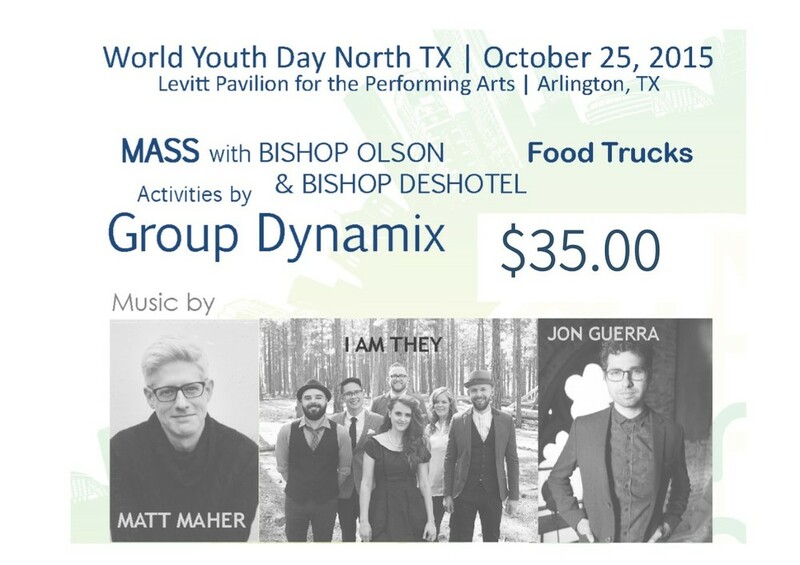 The Bishops of Dallas and Fort Worth host this event in order to celebrate Jesus with the youth of North Texas. Over 2000 teens will gather at Levitt Pavilion in Arlington for Mass, music and festivities. Bishop Deshotel and Bishop Olson will celebrate Mass to kick off the event. World Youth Day ends with a Matt Maher concert. Matt Maher is a nationally acclaimed Christian artist who is very Catholic. This event will feel much like a music festival as there will be musicians taking the stage all afternoon. An interactive area with games and activities along with a vendor area with merchandise and food trucks round out the event. Tickets are limited so make sure to reserve your spot today!